052. The Send-Off. Wilfred Owen Poem. Reintroduced By P.S.Remesh Chandran. Jean Jacques Bebel, the Swiss historian has calculated that in the 5000 years of the recent history of the world, only 282 years were devoid of any kind of wars. Peace is the brief interval between two wars. A shot sent at a visiting Prussian Prince and his wife by a young student at Austria, and the life of millions was shattered and the way of life of the world changed for ever. Horrors of the First World War were sung by thousands but Wilfred Owens’ poems were brought hot from the war front. The voice of the First World War passed away, knowing not about the fame that was to come to his name. If World War First had a voice, we can say that it was Wilfred Owen, employed in active service, singing about the horrors of war and killed in action. In his brief life time, only four of his poems were published, but after his death, dozens of them were published and brought out as books. It is believed, many of them have not still come to light. Awarded the Military Cross for bravery posthumously, he passed away in poetic anonymity, knowing not about the fame that was to come to his name in future. 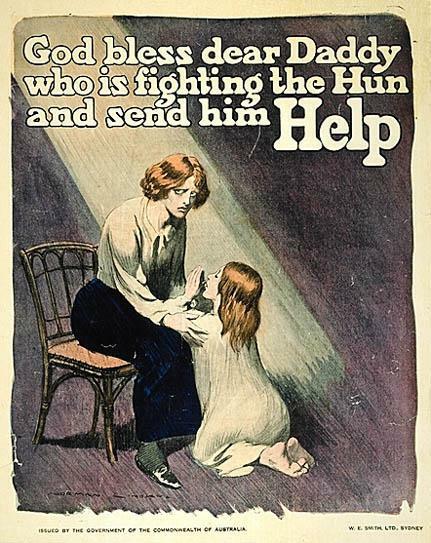 Speaking for men in the trenches under his leadership was what he did through his poems, which, it seems, were all written during the last two years of his life, 1917 and 1918. Soldiers sitting in trains, in funeral decorations, going to war front. Pre war breakfast. 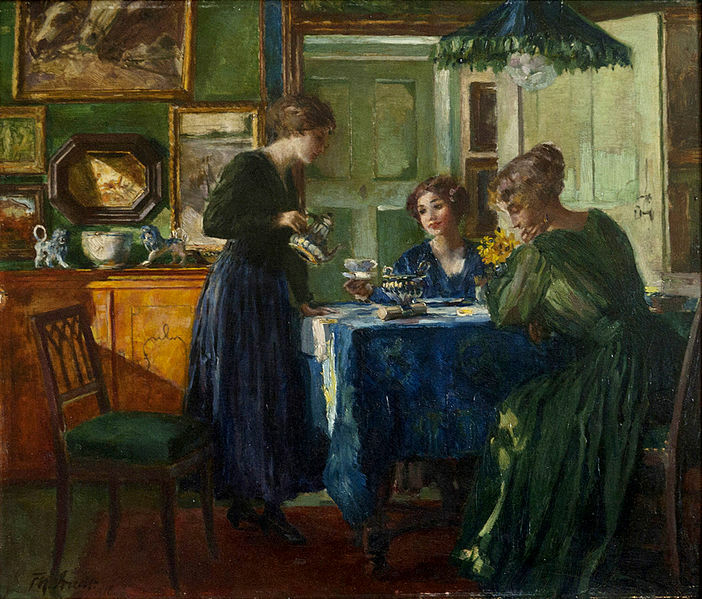 Ferdinand Max Bredt. Wilfred Owen was a British poet who was killed during action in the First World War. Insensibility, Strange Meeting and The Send-Off are his most famous anti-war poems in which he brings out the pity, realism and irony of war, reflecting his and his soldiers’ negative attitude towards war. He sees no romanticism or chivalry in war, but only death, destruction and decay. True, what else is there in war except the glory of victory for a few and the shame of defeat or death for many? But when defense of one’s motherland is concerned, opinions may vary and war may have to be justified. In the poem The Send-Off, soldiers in a mountain military camp are ordered to move out to war front, who sing their way to the railway siding-sheds and line the train with faces grimly gray, meaning faces darker than black. Decorations all white, like wreath and spray, are pinned to their breasts making them already looking like dead men clad in white, sitting in a row, all looking out the train windows. We are forced to think about the tremendous thoughts streaming through those troubled souls, someone’s father, brother, uncle, one among them certainly the poet himself. The strong sentiments these and the coming scenes create in our minds move us and carry us such away that we are forced to weep, cringe and shudder, which is this poet’s victory which he enjoys standing among the stars. How many of these soldiers will ever return? A few more minutes’ sunshine and mountain air before going to the frontier, never to return. Going to war. 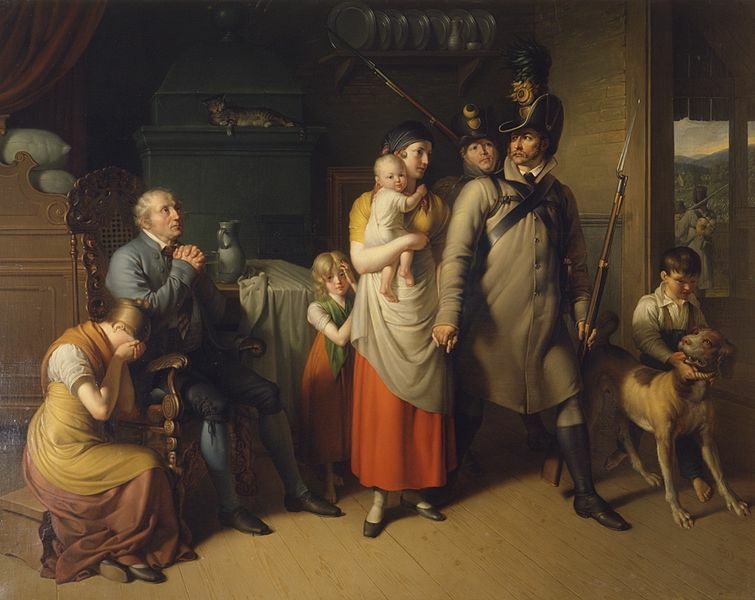 Johann Peter Krafft 1813. A military camp normally will be a nuisance to the local people there. So exactly there were none there to give them a proper send-off. Those people might only be glad to see them all go and never return. A few dull porters and a lone tramp were the only ones there to see them go and sorry to see them going too, for they were the ones who benefited from the camp, now losing their daily bread and jam. At least the mechanically punctual railway signals, unlike the local human beings, could have shown them a little of mercy by sparing them a few more minutes’ sunshine and mountain air. But they, the unmoved signals too, nodded heartlessly, a railway lamp winked to the guard and the train began to move, all in time. They were gone. Local girls are what add colour to mountain military camps. Farewell sisters. 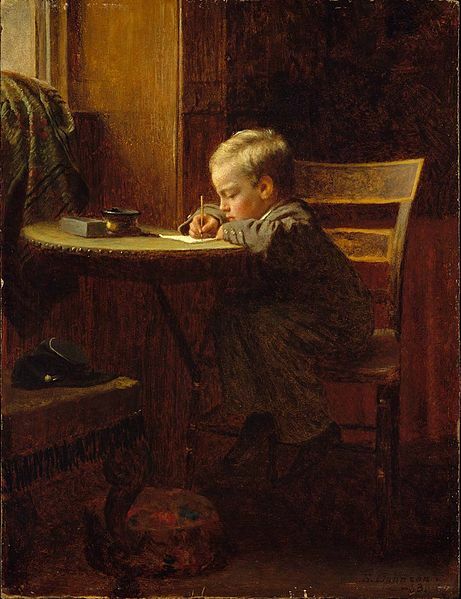 Writing to father in war. Eastman Johnson 1863. True, the soldiers were not soldiers but they were all hushed up heaps of wrongs and evil doings, the poet admits. They did wrong to the villagers and they will be doing wrong on the war front too. Therefore their losses in battle, limb or life, needn’t be regretted. All military movements are secret and under cover of night. So the people never heard to which war front these soldiers were being sent. As everywhere, the local girls were what added colour to the monotonous life in the upland camp. Romances might have budded and nipped. Tears and sighs might have been shed in darkness, and weeping farewells told in whispers. To meet and part, that is the soldier’s life. And they, the village girls, had jokingly asked them boys: cousins, will you ever return? The soldiers had mocked their words then, but after feeling the dead heat of the battle front, the poet wonders, whether they would still be mocking those meaningful words of the village women. For those who return from field to camp alive, trodden paths would be half-forgotten in their semi-madness. Help daddy gone to war. Norman Lindsay 1915. 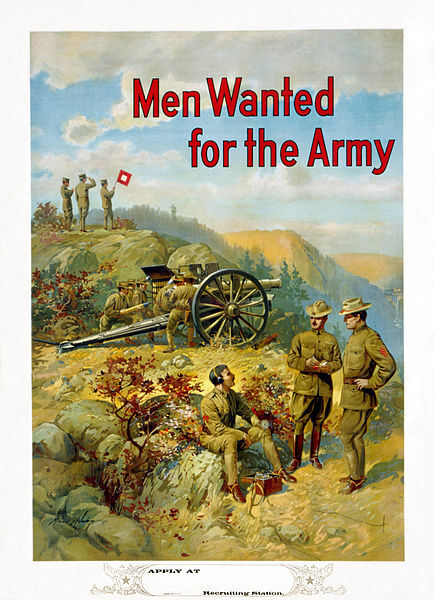 Soldiers gone to war front have a lesser chance of survival and returning alive to their camp, the least in those times. Direct combat was characteristic of military operations, till this war ended, when it gave way to covert operations, carpet bombing from sky and if possible, nerve gas and nuclear attacks. But in that dawn of 20th century, war techniques had not progressed much from the primitive. Only a few of them may return perhaps, too few to receive a proper reception of bells and drums and yells. And those who do return will be invalid, silent and thirsty apparitions, not walking but creeping back silent to still village wells, up half-known roads, yearning for a place to lower their weary bodies on. Even the once-familiar roads would be half-forgotten in their semi-madness, after having gone through the unspeakable horrors of war. Entered the services of the church, found it hopeless for the poor, and condemned it. 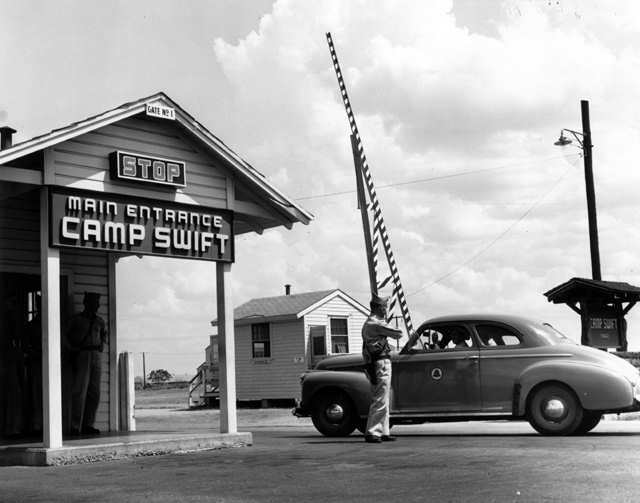 Mountain military camp entrance. U S Federal Govt. Wilfred Owen was born in 1893 and brought up in a religious atmosphere by his parents. His full name was Wilfred Edward Salter Owen. 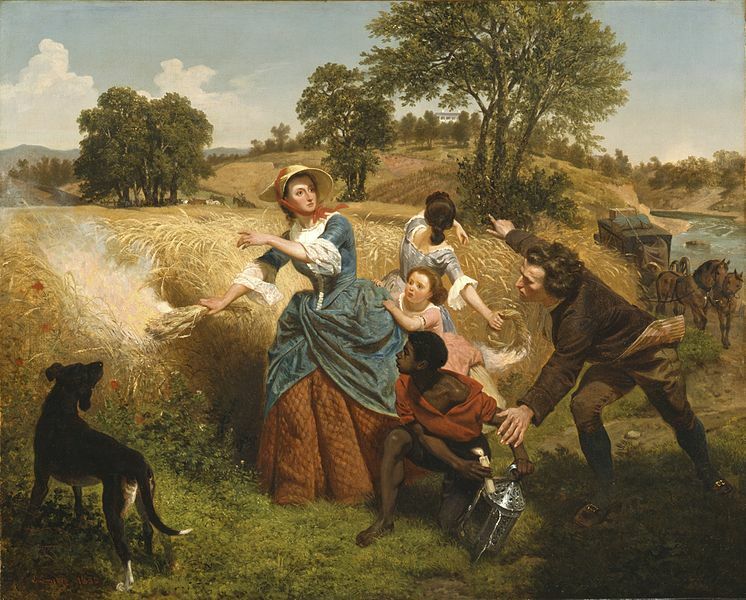 Fallen from fortune, this family could scarcely provide for the education of their four children; Owen served as a teacher-student and matriculated. Theologically trained by his mother, the Bible influenced him during this period. In the Reading University, he studied botany and old English. To earn boarding, lodging and tuition fees, he served as an assistant to the vicar at Dunsden parish, this close familiarity leading to contempt of church later. Reluctance of church to get involved in helping and alleviating the pain of the poor was what infuriated him to condemn church. Disillusioned by church, he left England for France and lived there for a while tutoring English and French in private homes when war broke out. The mother and son stood looking across the sun-glorified sea, looking towards France with broken hearts, saying goodbye to each other. In France, Owen staying and working near Pyrenees Mountain Ranges remained totally oblivious of war for a time. But copies of The Daily Mail newspaper his mother sent to him from England opened his eyes and he began to regularly go to a nearby hospital, acquaint with a doctor and inspecting war casualties brought there each day. At last he could no longer endure his impatience and in 1915, returned to England and volunteered to fight. He was sent again to France to fight in 1916 where from he was brought back wounded and shocked for recuperating. Before going to France for war, he and his beloved mother Susan Owen ‘stood looking across the sun- glorified sea towards France with breaking hearts, saying good bye to each other’ when the son quoted Rabindranath Tagore’s words ‘when I go from hence, let this be my parting word’. Susan Owen is known to have written a letter to Tagore when he was in England. We don’t know for sure whether her letter reached Tagore after her simply writing ‘Tagore, London’ in the address column of the envelope, but we certainly know about the reputation, efficiency and dignity of the British Postal Service, especially during the war period. Publication of his poems in time would have prevented Viet Nam nightmare. Reconnaissance before attack. 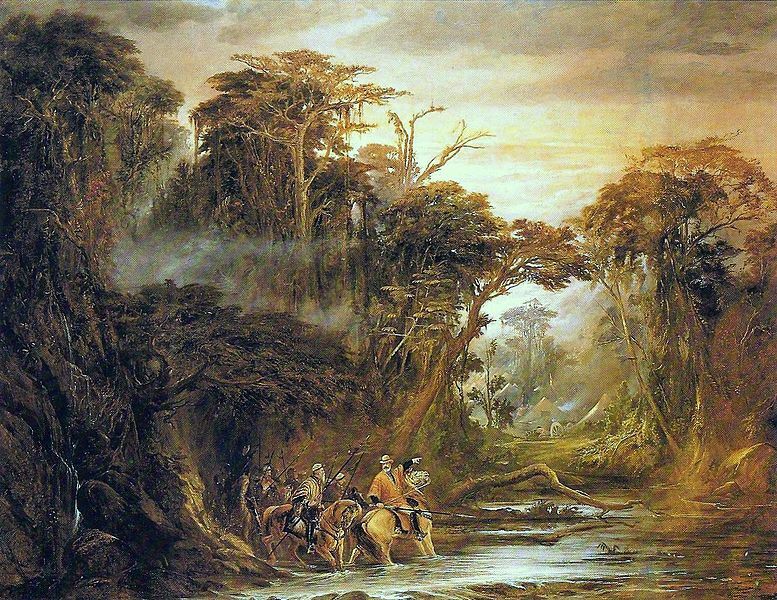 Pedro Americo 1871. Enlisted in 1915 into Rifles Officers’ Corps in England, shell-shocked in mortar explosion in a trench in France, and removed of all romanticism for war, he was removed to War Hospital and brought back to England for recuperating. His romantic ideas of war faded when his soldiers and he had to go through gas attacks, sleeping for months in the open in deep snow and frost, loosing friends to death and the stench of rotting dead blanketing the earth all around. War in his eyes now became just a political equation, unbalanced. No wonder he had to be admitted in the psychiatric department of the hospital. His were the same psychic experiences thousands of Viet Nam War Veterans went through decades later. Publication of his poems and experiences in time would have prevented altogether the nightmare we called Viet Nam and resulted in the governments’ adopting a more humane attitude towards soldiers. Back to regiment from safety, to die with loved friends and comrades. Even though Owen from his youth very much wished to become a poet and was impressed by the writings of Keats and Shelley, his actual writing of poems which made him world famous were written during the fifteen months he spent in trenches in the war front in 1917 and 1918. The war which once shocked him then seemed to thrill him, the reason for which can be attributed to the poetic sentimentality and recklessness to be with his loved friends and comrades in the war front in the days of their misery. Certainly like all poets or cowards, on regaining health and fitness, he could have left war and lived in security and safety after released from the War Hospital. He indeed had joined or formed an intelligent literary circle there in Edinburgh during the days of his recuperation. But instead, he returned to his regiment, to be killed days later, just before the war ended. In fact, his friends and family were eagerly waiting for his return when the news of truce reached them. The news of his death reached his village on November 11, 1918 along with the bells of armistice and peace. What horrifies us is the vain death of a brilliant poet in duty who filled his poems with the futility of war. It was the sacrifice of a poetical fame for fine citizenry. Would Owen have lived longer if he was recognized as a published poet and also given the Military Cross? Rejoining duty on fitness, he was delegated to lead a party to storm the enemy positions in a village in Ors. He seized a German machine gun and used it to kill a number of Germans. He was shot on the bank of a canal and killed while trying to cross the canal, only days before the war ended. He always considered him as a remarkable war poet, who he actually was, but only four of his poems had been printed by any publishers in his life time. That too was only because he happened to be the editor of the magazine The Hydra published by the War Hospital at Craig Lock hart, Edinburgh where he recuperated. And this Hydra Magazine had only a very limited circulation among the patients, doctors, nurses and staff of that hospital, a very discouraging situation for any poet. What would have happened had he not been shell shocked and admitted there but died directly in action? Would fate have changed his destiny if he had been given due recognition as a published war poet by printers…? He always sought in secret the Military Cross for his supremacy as the most talented war poet of his times, but it was awarded only after his death, in 1919. What if Military Cross had been awarded earlier while he lived…? Personally manipulated a captured enemy machine gun and inflicted heavy losses on the enemy. What the other side feels. 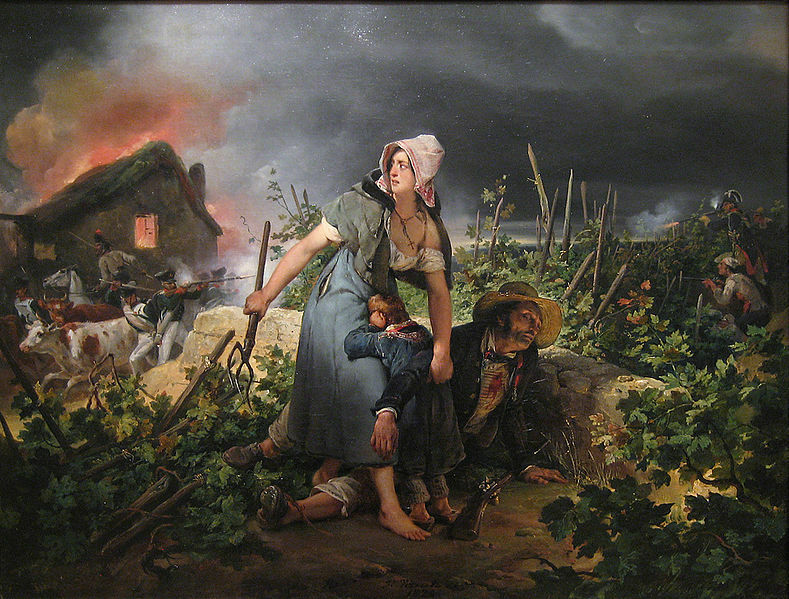 Horace Vernet 1814. The citation to the Military Cross awarded to the poet reads: ‘2nd Lt, Wilfred Edward Salter Owen, 5th Battalion. For conspicuous gallantry and devotion to duty in the attack on the Fonsomme Line on October 1st/2nd, 1918. On the company commander becoming a casualty, he assumed command and showed fine leadership and resisted a heavy counter-attack. He personally manipulated a captured enemy machine gun from an isolated position and inflicted considerable losses on the enemy. Throughout he behaved most gallantly’. Even after this Military Cross awarded for his gallantry, the world was not willing to acknowledge his poetry. Today, Wilfred Owen is a synonym for war poetry but for having been presented with this much fine war literature to read, we owe our debt to his family. He sent 600 letters to his loved mother who kept them all safe, from which was the war front feelings, emotions and experiences of Owen were discerned later. His sister donated these letters to the University of Oxford where people can still see them. His brother collected his manuscripts and helped bringing out his poems as a book. Writing boldly about the horrors of war was his catharsis to escape from shell shock trauma. 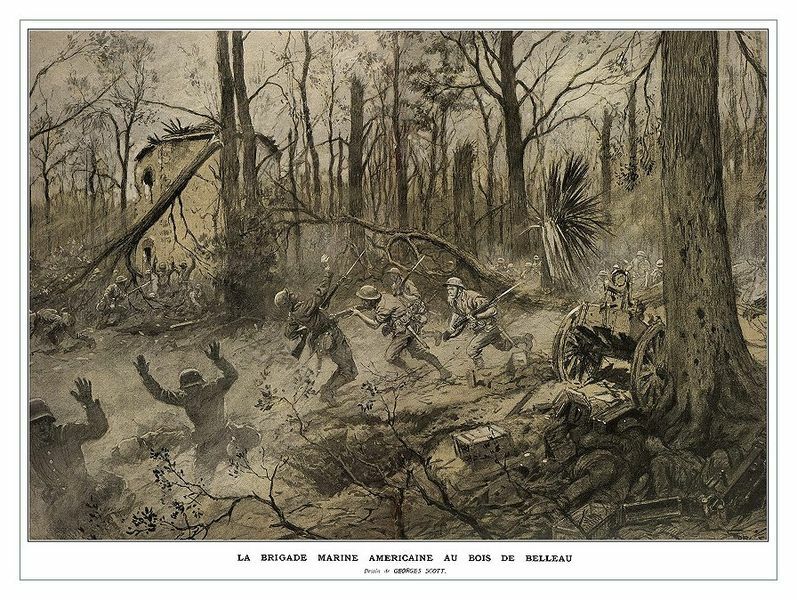 American marines in Belleau Wood. Georges Scott. Was Wilfred Owen overly influenced by friends like Siegfried Sassoon and physicians like Arthur Brock is still a thing of debate, which they did more or less. Sassoon himself was an accomplished poet who advised Owen to abandon the old style he followed since when he was ten years old and turn to more seriously writing about the futility of war. We shall dismiss all critics’ allegations of them sharing an attachment more than manly. Arthur Brock treated him when he was admitted in the War Hospital following shell shock trauma and advised him not to try to forget the horrors of war which haunted his mind, but to go straight continuing to boldly write about them which would serve as his catharsis, a fine clinical advice in those times of Sigmund Freud. Anyway, since joining the army and fighting in the front line, we see a dramatic change in the poetic style of Owen. Every soldier who took part in the world war underwent war horrors and trauma which went untold in the chronicles of historians. With Owen putting them into words after actually experiencing them, recorded them in livid humility for future generations to see and evaluate in times to come. World War started with liberation, and ended with cessation, annexation and colonization. The dead soldier. 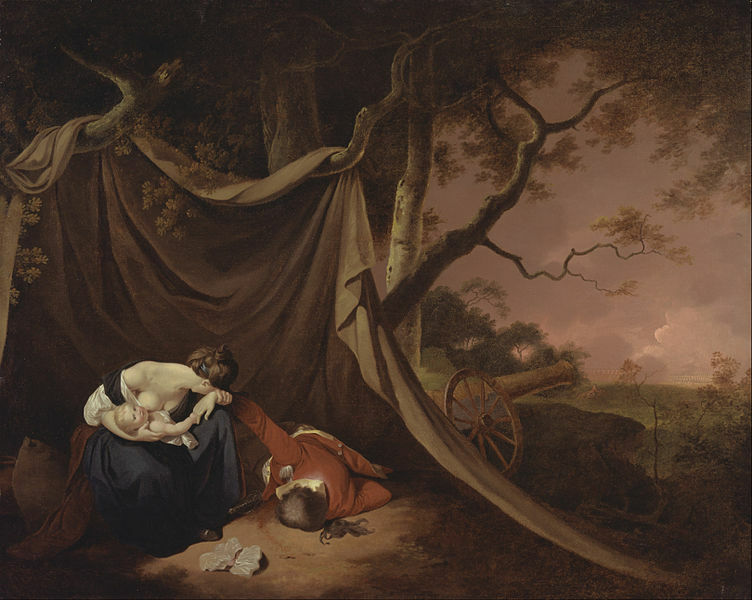 Joseph Wright of Derby 1789. Liberation of Belgium was the objective with which the First World War started but war politics soon turned into the objective of grabbing colonies for future which the civilians did not recognize but poets like Wilfred Owens and philosophers like Bertrand Russell did, and they reacted through their writings to rouse civilian conscience. Theirs was not blind rage against wars but mature protest against abandoning the honoured causes of war and turning to use war to grab colonies. Owen’s poem ‘The Strange Meeting’ even went to creating the extreme human situation of a dead American soldier meeting a dead German soldier whom he had killed and listening to his version of the war, the enemy finally becoming a friend. The front line picture painted by Wilfred Owen in The Send- Off. What is left of a war. 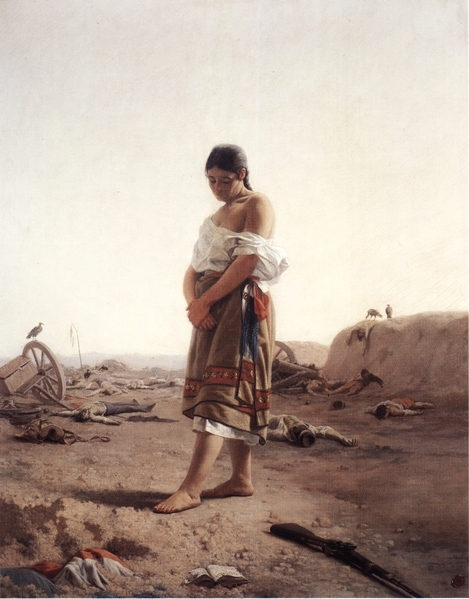 Juan Manuel Blanes 1879. Publishers of his times ignored him, perhaps due to their inability to cope with or even go through the great quantity of war poetry poured in each day. He, as an acclaimed poet and as a civil servant dedicated to those soldiers under his care, wanted only for his poems to be read by all and the people to open their eyes to the futility and horrors of war. Who can say this brilliant young man who sacrificed his life for his country would try to limit the circulation of his poems by wishing not to be read here again? We think it only just and fair to include his lines here, without which this appreciation won’t be complete or contained. See the front line picture painted by Wilfred Owen in The Send-Off. War is an unnecessary expense in which nations waste resources and innumerable units of precious time and man power. To defeat another country, we spend unimaginably huge sums of money. Most often those countries could be bought with only a fraction of this money. Such futile and waste is war because it never improves mankind. Thank you dear Sivaramakrishnan A for your informative and inspiring note. Wow! what a nice piece of article to read, wonderfully attached paintings and pictures. Thank you Ramesh ji. When I saw these paintings and pictures for the first time, I thought they were waiting for the right literary creation. Wilfred Owen’s Send Off suited them most. I am immensely thankful to those painters and photographers who were moved like Owen by the horrors of war, to create these masterpieces. I hope the painters, photographers and the poet would supplement each other. Thank you dear Md Rezaul Karim for caring to leave a comment. When I read your articles in Wikinut, I feel the same as you noted here. What can I say when a compliment comes my way from an accomplished writer like you? Thank you dear Madan G Singh. Thank you RameshChandra. It is time war and violence are removed from the face of the earth. What use making all the arms for them to fall into “wrong” hands! What use a piece of peace treaty for those killed, maimed and orphaned? Even the survivors and victors carry severe scars mentally. Politicians start the war making use of the innocent people creating hatred. And the less said about religious fanatics of all hues the better – all Gods can defend themselves, thank you! They don’t need our help! Best regards – siva. Thank you for the nice words, but I feel I am ordinary. But I really appreciate your writing. Previous The Healing Artist. Scenes From The Life Of Jesus Christ 2. Paintings Of James Tissot. P.S.Remesh Chandran. Next Doctors, Politicians, Bureaucrats, People and Private Practice. Documentary Essay. P.S.Remesh Chandran. I will write poems .